Fair Trade Certification raises income and living standards for tea farmers overseas, while helping to protect the environment by investing in their farms and communities. The Fair Trade Certified™ logo you see on our Organic Fair Trade Tea labels guarantees you are receiving a superior quality product, farmers and workers received a fair price for the product, and eco-friendly practices were used in crop production. We’re proud to offer 12 organic varieties of Fair Trade teas! They’re certified by Fair Trade USA, an independent non-profit organization that monitors and certifies Fair Trade products in the US. We work with an unrivaled network of carefully selected Certified Organic and Fair trade farmers from all over the world to provide unmatched quality and consistency in our teas. THIS DEAL IS ENDING TODAY!!! When you purchase products that have been Fair Trade Certified™, you help improve the quality of life in the communities that make the products you enjoy! For more information on Fair Trade, visit fairtradeusa.org. 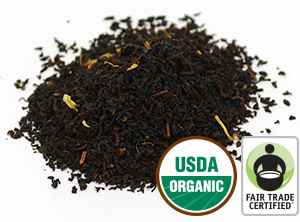 Mango Ceylon is but one of our Organic Fair Trade Teas! Please add the coupon code TEA2016 at the bottom of your shopping cart when purchasing any of our Starwest Organic Fair Trade Certified™ Teas. * This offer is valid for online retail orders only. Offer good from October 4th to October 14th, 2016 at 11:59 PM PST. October is here. Fall will be upon us, and you’ll need something warm and comforting very soon. Try our delicious Mulling Spices for making cider or hot mulled wine (perfect for Halloween night, by the way!). Just add some to one of our easy-to-use Culinary Bags! Or if you’re feeling decadent and want to wind down your day with a rich cup of hot chocolate, try one of our Kylie’s Organic Cocoa Mixes!